We’ve been hunting the northern woods together as a family tradition for more than 25 years. In all those years, there were many times where the weather didn’t cooperate, the timing of the season didn’t work out *just quite right* and yet we were always successful hunters. 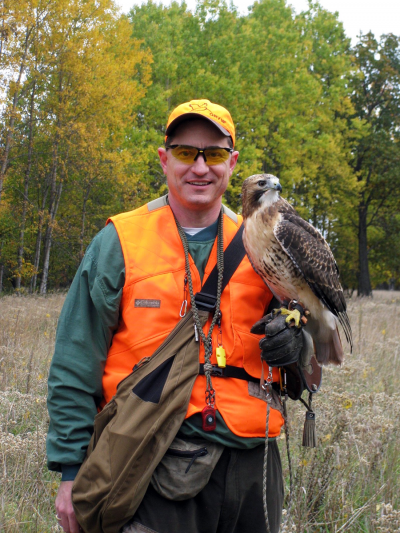 This year, it would seem that the harsh winter of 2014 took it’s toll on the populations of Michigan game birds (ruffed grouse and woodcock) and took down many of the birds that we had hunted in past years. We’ve scouted special hunting areas for years, changed up our tactics based on the weather, time of day, food and cover and ALWAYS found birds. After 25 years of hunting these ‘gooney-birds’ we expect to get better at our craft each year, and we are getting better each year. This year, however, the birds were not in the same great habitat places in any numbers comparison to previous years. A disappointment for the season for sure, but these things happen with severe winters. This picture is a preview of things to come if you have ever come across these marks in the forest. 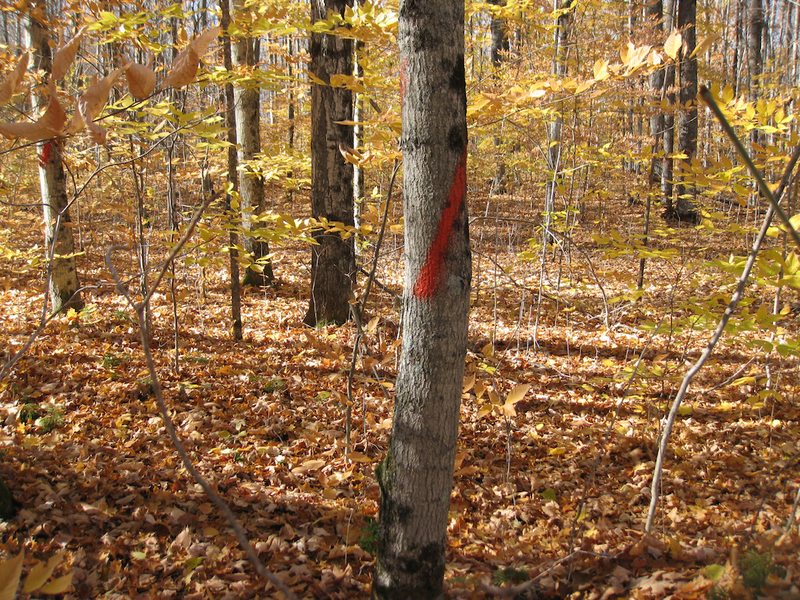 The marks on the trees indicate that these are about to be harvested from the forest for some logging program. While this saddens my heart to know that we are loosing some great grouse habitat, it will return in a few years time. The transitional zones of the hardwood forest are always great grouse areas to hunt and it will only take 7-10 years for these areas to recover after logging. Looks like it’s time to go scouting again along two-tracks for another hunting area for a couple of years. I’ve made this a tradition, if nothing more than a reason to keep my site up to date. A fall hunting profile picture that best displays my current Red-Tail and myself in the fall evening. I so enjoy hunting in the fall in the northern woods of Michigan. The Annual Bird Camp Weekend is always a fun time with family in the woods of northern Michigan. This seasonal gathering at the cabin was later than usual, but was still a great time together. Our usual hunting spots were less productive this year than in previous years. Flushes were down and number of birds were down as well. It’s difficult to say just what was the cause of the difference in our hunting experience this year, but there are a few factors that we think contributed to the off-year. Hurricane Sandy ripped across the eastern United States just a few days before this weekend and had a significant impact on the weather in Michigan for the previous four days. The hunt was two weeks later than in previous years which has effects with the weather (it was colder) and the Woodcock had migrated through the area already. Lastly, the hot, dry summer seems to have affected the food sources for many of the wildlife animals that inhabit the forest. Wintergreen berries and thornapples were very scarce which is a typical favorite food of the Ruffed Grouse. We ventured to the typical hunting areas that we have code names for: Gooney Bird Central, DoodleVille East and West, along with “The Meadows”. Each place has it’s own character and set of stories from adventures from years past. We had enough flushes each day just to keep it interesting, but not quite the action packed adventures like in past years. That’s the way it goes sometimes, and as much as I practiced this summer at sporting clays, it did serve me well this year as I was the only successful hunter this year with one Partridge in the bag. Tough luck for a tough year. We’ll get em next year. Autumn is my favorite season of the year. There are many reasons for this, too many to name and list. The colors changing on the trees create the best visual eye-candy that Natural Michigan has to offer. As another fall begins, the hunting tradition is rekindled once more. The autumn colors, the crisp fresh air, I look forward to this weekend every year. There is no better season for me than the fall; being able to walk in the woods, hike through the great wilderness in Northern Michigan, and hopefully find some woodland creatures to interact with. The cool, crisp mornings that focus the senses, the musky aromas of the fallen leaves and fading grasses that linger in the memory to recall the moment. The clear nights and stars that come early, and last late into the morning. All these things and more make the fall an exciting time to enjoy nature at it’s best. 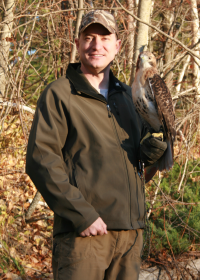 It is this tradition that assisted in my falconry journey and that is precisely why I am including it here. I got into hunting when I was a small boy; I grew up with it. Hunting has always been a tradition in our family, and I’ve always enjoyed the outdoors for the many wonders the outdoors provides. It’s great exercise walking through the woods, and there are no better places than the areas we hunt. The thrill of the hunt adds to the excitement as we walk through the woods looking for birds. It’s always a challenge to find the Ruffed Grouse in the northern woods. There are so many names for them: Grouse, ‘Pat’, Partridge, heck, we even call them “Gooney-Birds” because of the gooney stuff they do. Whatever you call them, they are a challenge to find, shoot, and knock out of the air. Woodcock are another great target that we regularly scare up out of the woods. This year we were able to venture to our favorite hunting grounds. These areas that we hunt get their names from past adventures of when we first hunted the area. We have ‘Gooney Bird Central’, an area where the tag alder and the thornapple trees are thick, as are the ruffed grouse that we hunt. There is another place, not to far from this area, called ‘Squeaky Tree.’ After hunting this area for an afternoon, and scaring up a few grouse, we returned to the truck for a break one afternoon, only to listen to the wind blow through the branches of a large oak tree, rubbing it against another producing an audible ‘squeak’ of wood on wood. Another area that we are fond of is named “Doodleville.” We even have an ‘East’ and a ‘West’ area to this hunting preserve. It is some prime grouse country on the shores of Loon Lake in the Presque Isle County that we reside in at the Hunting lodge. One of the largest areas that we can enjoy for an entire day is called ‘The Meadows’. This is a large plot of state land that runs itself into a great duck hunting swamp, but we never seem to make it back to that area. The Meadows is an area where some bow hunters have tilled the area (we are talking about 10 acres) and planted rye, clover, and often wheat to entice the deer to this commons. Again, this area borders some wetlands that are prime cover for some ducks, and also, as a side effect, provides a great home to the ruffed grouse. 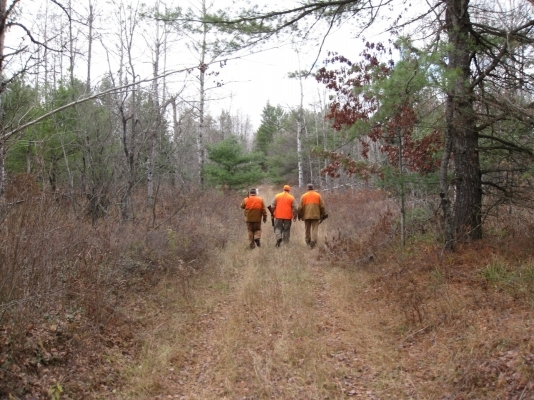 Another area that we like to go to at least once during the hunting expedition is near Cranberry Lake. We call this place, ‘Cranberry Lake’, oddly enough. This is another section of pine-oak forest with a border of tag alder trees that provide the perfect habitat for our quarry. The unique attribute of this area is that it borders on Cranberry Lake, which usually holds a great deal of ducks. All of these areas are within 35 minutes drive from the ‘Hootch’, the great hunting lodge where we take up are refuge from the elements. In our traveling this weekend, I cannot recall another time when I saw so many eagles! We counted about 10 Bald-Eagles in our travels over a weekend. That’s pretty amazing, considering that for years I never saw one! In 1997 I began deer hunting. My Uncle has 350 acres of prime Northern Michigan forest with the Hunt Creek running right through the property. He has maintained 15 deer blinds and several miles of ATV paths on the property. 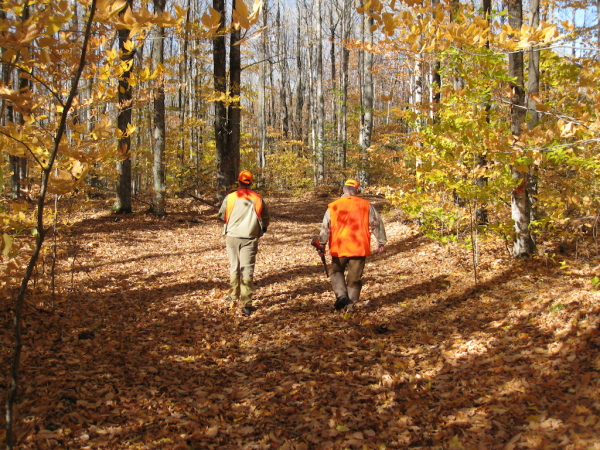 Part of the tradition with keeping the hunting lands ready for each fall involves a weekend in September of wood cutting, lane cutting, and path clearing. 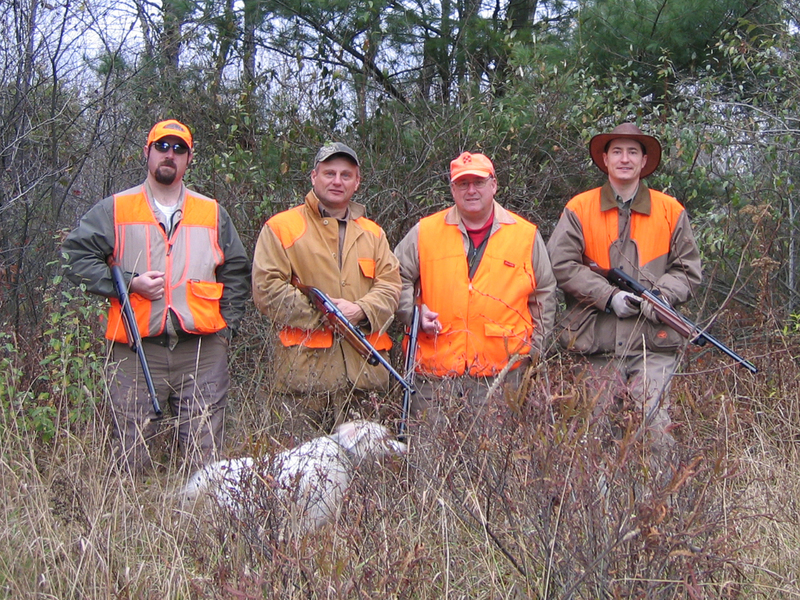 It’s a great setup that enables everyone to be safe while hunting during rifle season. In my years of hunting deer, I’ve only been successful twice, and each time it was quite a thrill. The major draw for deer hunting is the deer camp experience with the camaraderie of the uncles and cousins that we have grown up with over the years. It’s a great time to spend in the woods and watch as the day unfolds while sitting in the deer blind waiting to spot some game. Our hunting crew consists of the four of us (pictured above) guys who always have a great time when we gather at the Hootch for Partridge Hunting. It is this brotherhood that keeps us coming back year after year together to go out in search of quarry in the woods. Many people think that a Hunting Camp or weekend is about killing animals. While I know there are folks that would argue about this, I would say that the main reason that folks go out into the wilderness is to be in the outdoors. Sure, bagging a big buck or shooting the forest up can be exciting, but knocking down a deer is far from a guaranteed thing, and neither is bird hunting a guaranteed successful hunting excursion. This year was an exception to the four of us, with Uncle Mike unable to join us due to work responsibilities. Ah, well, it happens some years. This first year of my falconry apprenticeship adds a new dimension to both the Bird Hunting weekend and the Deer Camp experience. I’ve been preparing the guys for the additional hunting partner, and they are very excited. With only a few more weeks before deer camp, I hope to get in some keen hunting excursions with Tahoe before Deer Camp so I know she is ready. 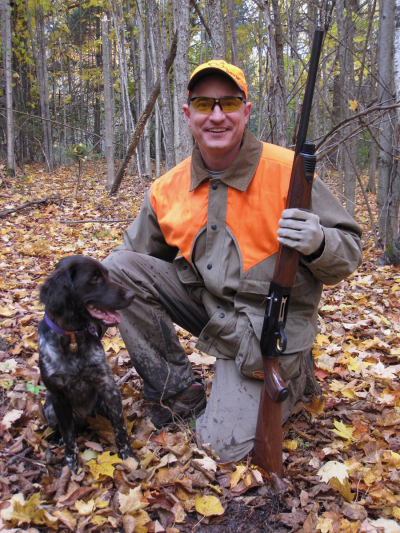 During grouse hunting, we were not able to get out to a hunting area with enough game to ensure a successful hunt, which is why I opted for some Hunt-Training experiences instead. We should be ready to go for deer camp in a couple of weeks. Hunting, the outdoors, and falconry will be my legacy, for I am a legend of the fall.